I guess I'm stuck on windowpanes all of a sudden. Maybe it has something to do with looking at my windows and knowing they need cleaned. I could have reversed things and worn a striped shirt underneath the windowpane tie but decided instead to stay solid with an ecru, pinpoint straight collar. 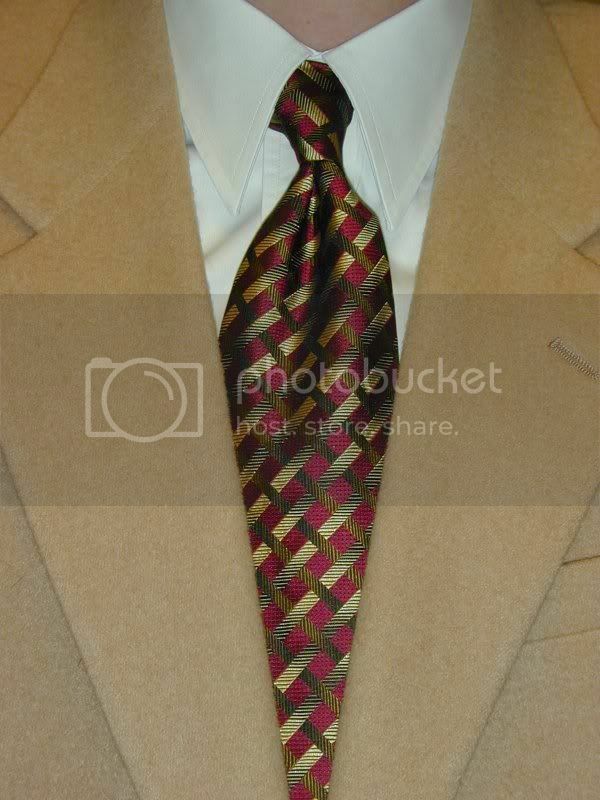 The tie has a burgundy background with varying shades of olive and gold criss-crossing the blade. It's another Jos A. Bank Signature series but it's not self-tipped like most of the others I have. The tan sport coat tops it all off. The gold stripes fit the tan coat quite well. I could have used an overcoat today as the rain was on that fine edge of turning to snow. Burrr! Who said it was Spring? Probably my favorite of your ties so far. And... ecru? This from the guy who avoided "outfit"? OOops! I slipped up and let "ecru" out. I only know that it's ecru because that's what they called it in the catalog. I'm going to have to get a live journal account so I can leave comments over in your neck of the woods, so to speak.